Home » Blog » What is the secret to a successful direct mail campaign? 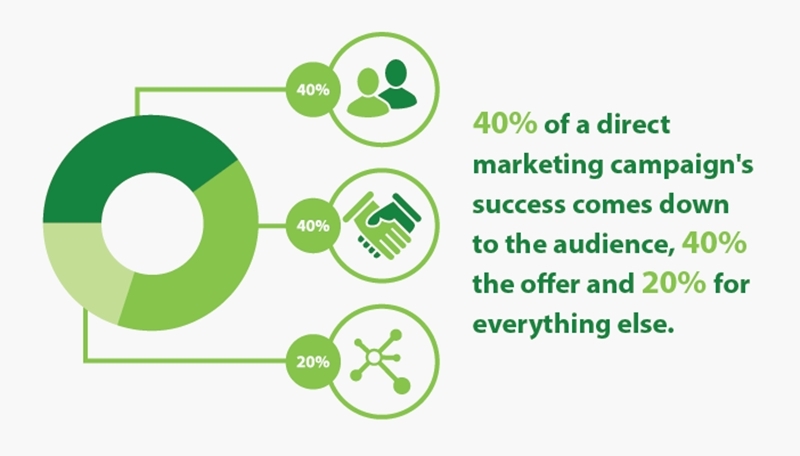 What makes a direct marketing campaign a success? Perhaps it's the quality of the mailing piece or the practice you've had in the past? While both of these have a part to play, ultimately, it comes down to the soundness of the marketing list and the persuasiveness of the offer. US-based marketing print company PsPrints gives us a nice and simple rule of thumb for every direct marketing campaign – the 40/40/20 rule. That is, if we were to quantify what will make your campaign work or not, 40 per cent will be down to your audience, 40 per cent your offer and 20 per cent everything else. This means that all of the designing and beautifying of the mailing piece will only be worthwhile if you have the more important 80 per cent right – the audience and the offer. So let's take a look a little more in-depth at these primary components. "When you've got the right audience in place, everything that follows is much more focused." Writing for Marketing Today author and direct response marketing specialist Robert W. Bly argues that a fantastic direct mail piece in terms of design and copy may generate twice as many leads as a poorly presented offer. However, having the best marketing list can generate ten times more traffic than if this part was to not hit the mark, he says. In fact, according to the Mr Bly, the best way not to fall into this trap is to compose mailing pieces only once you know who the audience is. Often, you will only know this once you have decided which list to go for. If you know the actual details of your audience rather than just some general characteristics of those in your target market, you will have far better knowledge to develop and compose an offer that is compelling rather than cliched. In fact, founder of The Prospect Shop Martin Ruane agrees that this the most fundamental part of any direct marketing campaign is zeroing-in on exactly who the recipients will be. "There's essentially a lot of money that can be wasted if you don't think about narrowing down the audience from the beginning," said Mr Ruane. "When you've got the right audience in place, everything that follows is much more focused." The offer is much more than just what you are trying to sell or the way you word it. It is something that gives the recipient a valuable reason to act upon the marketing communication. Think of a "60 per cent off storewide" sign in a retail shop that shoppers naturally beeline towards. It is essentially something that your audience will not be able to resist. Creativity is essential to developing an offer that stands out and persuades. Ron Brauner, Vice President of Marketing for insurance solutions company Assurant Solutions, consolidated a list of more than 50 tried-and-tested direct marketing offers. From buy one get one free, coupon discounts, exclusive offers, sweepstakes and virtually anything free, the most important thing to remember is that the offer needs to be oriented towards your company's products and the audience's desires. Mr Brauner emhpasises how creativity is essential to developing an offer that stands out and persuades. But he doesn't mean pretty colours and pictures. He means thinking outside of the strategy box to find out what will make your audience tick. "Look at your offer impartially and ask somebody independently what they think or how they would respond," said Martin Ruane. "Getting different perspectives and viewpoints is important, especially when coming up with your offer." Only once the audience is identified and the offer is optimised should you start considering tactical questions, such as which channels to use and how to design the content. It's primarily about getting the strategy right, so working with a experienced list broker from the beginning can help you make sure you don't fall into any traps along the way.